It was a cold and clear day on Dec. 1, 1958 as 1,600 students walked to Our Lady of the Angels school on Chicago’s West Side. As students waited for the final bell at the end of the day, a fire raged unnoticed in the northeast stairwell. By the time they became aware of it, the second floor hallway was filled with smoke, and six classrooms of fourth- through eighth-graders were trapped. Within minutes, 92 students and three nuns were dead. Told through vivid first-hand accounts and stunning archival footage, “Angels Too Soon” would be the first full-length documentary to tell the important story of a mystery that remains unsolved. Narrated by the late “Chicago Tonight” host John Callaway and produced by Jay Shefsky, the hourlong documentary also seeks to answer some painful questions: How did this terrible catastrophe happen? How could it have been averted? And who should bear responsibility for unsafe conditions in the school? Viewers will learn that while the Cook County Coroner’s Inquest investigated the fire without assigning blame, the report of the National Fire Protection Association was harshly critical of “those in authority.” The program also explores the stunning confession of a 10-year-old student at the school, and the judge’s decision to find the boy innocent. We learn of the fire’s lasting effect on survivors and their families in this close-knit community, and “Angels Too Soon” calls into question one of the most persistent stories of the fire: the charge that nuns endangered their students by insisting that they pray, rather than escape. More ways to watch: “Angels Too Soon” airs 6 p.m. Saturday, Dec. 1 on WTTW Prime. You can also purchase a copy of the film here. 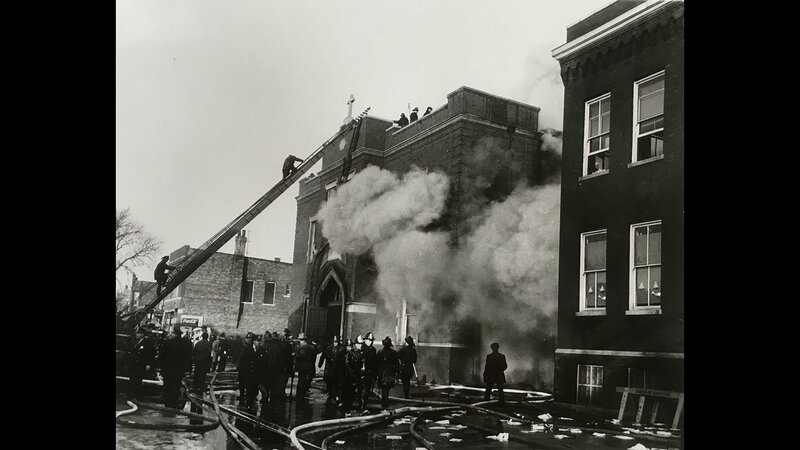 10 a.m.: Historian Jim Gibbons will make a presentation on the fire at Robert J. Quinn Fire Academy, 558 W. De Koven St.
2 p.m.: Special memorial mass by Cardinal Cupich at Our Lady of the Angels Mission Church at Avers Avenue and Iowa Street. 11 a.m.: Members and alumni of the Royal Airs Drum Corps will hold a graveside memorial at Queen of Heaven Cemetery. 5 p.m.: 60th Anniversary Memorial Mass at Holy Family Church, 1080 W. Roosevelt Road.